^ Gade, Martin (March 15, 2008). "The European Marginal and Enclosed Seas: An Overview". In Barale, Vittorio. Remote Sensing of the European Seas. Springer Science+Business Media. pp. 3–22. ISBN 978-1-4020-6771-6. LCCN 2007942178. Retrieved August 28, 2009. Lefkada, or Leucas or Leucadia or Lefkas or Leukas, is a Greek island in the Ionian Sea on the west coast of Greece, connected to the mainland by a long causeway and floating bridge. The principal town of the island and seat of the municipality is Lefkada and it is situated on the northern part of the island, approximately 1 hour by automobile away from Aktion National Airport. The island is part of the unit of Lefkada. Lefkada measures 35 kilometres from north to south, and 15 kilometres from east to west, the area of the island is about 302 square kilometres, the area of the municipality is 333.58 km2. Its highest point is the mountain Stavrota,1,158 metres above sea level, the east coast section of the island has small resorts of Lygia and Perigiali, all north of Nidri, the largest resort on the island. It is set in a location with views across to Skorpios and other small islands. The main coastal road from Lefkada to Vasiliki runs through the village, there are regular car ferries to Kefalonia and Meganissi. 20 kilometres south of Nidri is the resort of Vasiliki, a windsurfing center, there are ferries to Kefalonia and Ithaca from Vasiliki. South of Vasiliki is Cape Lefkada, where the Greek female poet Sappho allegedly leapt to her death from the 30 m high cliffs, the famous beach of Porto Katsiki is located on Lefkadas west coast. Lefkada was attached to mainland Greece, the Corinthians dug a trench in the 7th century BC on its isthmus. The island has a typical Mediterranean climate, hot summers and cool winters, the myth about Sapphos suicide at Cape Lefkada is related to other myths linking the island to the ancient Greek goddess of love, and to Odysseus, the hero of Homers Odyssey. There have been suggestions by local officials that several passages in the Odyssey point to Lefkada as a possible model for Homeric Ithaca. According to Strabo, the coast of Acarnania was called Leucas in earlier times, the ancient sources call Leucas a Corinthian colony, perhaps with a Corcyraen participation. 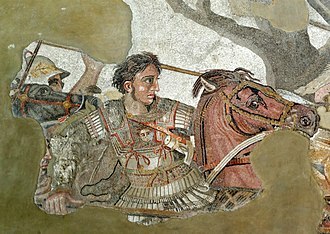 During the Peloponnesian War Leucas had joined the Spartan Confederation, Lefkada was part of the Despotate of Epirus until 1295 when it passed from Despot Nikephoros I to his son-in-law John Orsini. Parga is a town and municipality located in the northwestern part of the regional unit of Preveza in Epirus, northwestern Greece. The seat of the municipality is the village Kanallaki, Parga lies on the Ionian coast between the cities of Preveza and Igoumenitsa. It is a town known for its scenic beauty.796 km2. In antiquity the area was inhabited by the Greek tribe of the Thesprotians, the ancient town of Toryne was probably located here. The village of Parga stands from the early 13th century and it was originally built on top of the mountain Pezovolo. 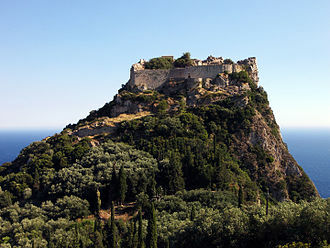 In 1360 the Pargians, in order to avoid the attacks of the Magrebins, during that period, with the help of the Normans, who held the island of Corfu, the fortress of Parga was built. 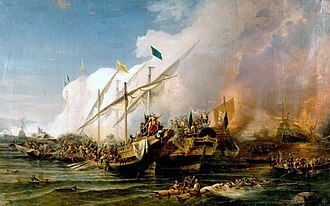 In 1401 a treaty was signed with the Venetians, and the rule of Ionian Islands passed to them, the Venetians respected the lifestyle of the Pargians who provided, in turn, invaluable assistance to the fleet of the Venetians. At the same time the Pargians fought by the side of their compatriots to throw off the Ottoman rule, as Parga was the only free Christian village of Epirus, it was a perfect refuge for persecuted fighters and their families. 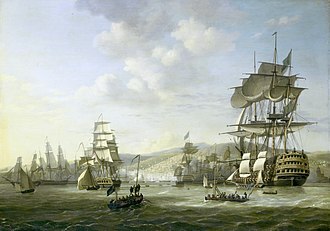 In 1797 the area, along with the Ionian Islands and Parga, fell into the hands of the French, in 1815, with the fortunes of the French failing, the citizens of Parga revolted against French rule and sought the protection of the British. In 1817, following a treaty between Britain and the Ottoman Empire, the British granted Parga to the Ottomans, the former citizens of Parga never ceased to dream of returning to a free country and to participate actively in the struggle for liberation. But they had to wait almost 100 years for this and the rest of Epirus was liberated from the Ottoman rule on 1913 following the victory of Greece in the Balkan Wars. The Castle is found on the top of a hill overlooking the town and was used to protect the town from the mainland and it was initially built in the 11th century by the residents of Parga to protect their town from pirates and the Turks. 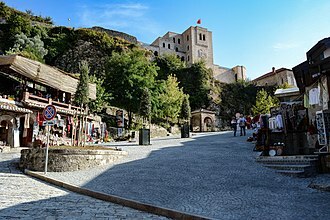 In the 13th century, as their control of the region increased, in 1452, Parga and the castle were occupied by the Ottomans for two years during which time part of the castle was demolished. Ancona is a city and a seaport in the Marche region in central Italy, with a population of c.101,997 as of 2015. Ancona is the capital of the province of Ancona and of the region, the city is located 280 km northeast of Rome, on the Adriatic Sea, between the slopes of the two extremities of the promontory of Monte Conero, Monte Astagno and Monte Guasco. Ancona is one of the ports on the Adriatic Sea, especially for passenger traffic. Greek merchants established a Tyrian purple dye factory here, in Roman times it kept its own coinage with the punning device of the bent arm holding a palm branch, and the head of Aphrodite on the reverse, and continued the use of the Greek language. When it became a Roman colony is uncertain and it was occupied as a naval station in the Illyrian War of 178 BC. 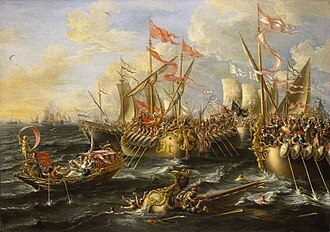 Julius Caesar took possession of it immediately after crossing the Rubicon and its harbour was of considerable importance in imperial times, as the nearest to Dalmatia, and was enlarged by Trajan, who constructed the north quay with his Syrian architect Apollodorus of Damascus. At the beginning of it stands the marble triumphal arch with a single archway, Ancona was successively attacked by the Goths and Saracens between the 3rd and 5th centuries, but recovered its strength and importance. It was one of the cities of the Pentapolis of the Roman Exarchate of Ravenna in the 7th and 8th centuries, in 840, Saracen raiders sacked and burned the city. 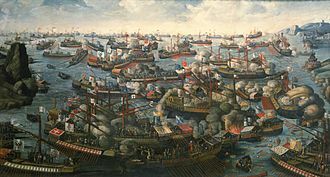 After Charlemagnes conquest of northern Italy, it became the capital of the Marca di Ancona, after 1000, Ancona became increasingly independent, eventually turning into an important maritime republic, often clashing against the nearby power of Venice. An oligarchic republic, Ancona was ruled by six Elders, elected by the three terzieri into which the city was divided, S. Pietro and Capodimonte. 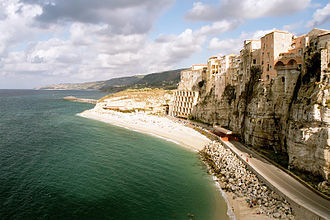 It had a coin of its own, the agontano, Ancona was usually allied with Ragusa and the Byzantine Empire. In 1137,1167 and 1174 it was enough to push back the forces of the Holy Roman Empire. 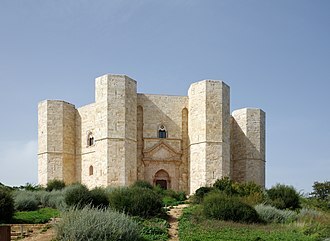 Anconitan ships took part in the Crusades, and their navigators included Cyriac of Ancona, in the struggle between the Popes and the Holy Roman Emperors that troubled Italy from the 12th century onwards, Ancona sided with the Guelphs. Cephalonia or Kefalonia, formerly known as Kefallinia or Kephallenia, is the largest of the Ionian Islands in western Greece. It is a regional unit of the Ionian Islands region. It was a former Latin Catholic diocese Kefalonia–Zakynthos and short-lived titular see as just Kefalonia, the capital of Cephalonia is Argostoli. The main island of the unit is Cephalonia and has a size of 773 km2. The town of Argostoli has one-third of the islands inhabitants, Lixouri is the second major settlement, and the two towns together account for almost two-thirds of the prefectures population. 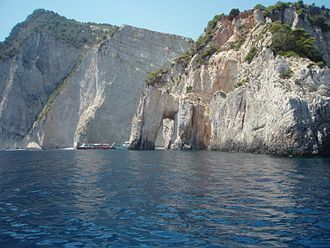 The other major islands are, Petalas Island, Asteris Island, Cephalonia lies in the heart of an earthquake zone, and dozens of minor, unrecorded tremors occur each year. In 1953, a earthquake destroyed almost all of the settlements on the island. Important natural features include Melissani Lake, the Drogarati caves, the island has a rich biodiversity, with a substantial number of endemic and rare species. 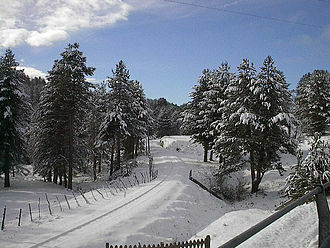 Some areas have been declared a site in the European Union’s Natura 2000 network, the top of Mount Ainos is covered with fir trees and is a natural park. Forestry is rare on the island, however its output is one of the highest in the Ionian islands. Forest fires were common during the 1990s and the early 2000s, Cephalonia is well known for its endangered loggerhead turtle population which nest on many beaches along the south coast of the island. Caves on these parts of the coast offer ideal locations for the seals to give birth to their pups, the European pine marten is known to live on the island. Over 200 species of birds have been spotted on the island, Cephalonia is a distinct regional unit of the Ionian Islands region, and the only municipality of the regional unit. The seat of administration is Argostoli, the main town. Amid the 2011 Kallikratis government reform, the unit of Kefallinia was created from part of the former Kefalonia. During the same reform, the current municipality of Cephalonia was created from the eight former municipalities, the Cephalonia regional unit includes a number of uninhabited islands of the Echinades group. They are administered by the municipality of Pylaros and he was rewarded with the island of Same, which thereafter came to be known as Cephallenia. Salento is a geographic region at the southern end of the administrative region of Apulia in Southern Italy. It is a sub-peninsula of the Italian Peninsula, sometimes described as the heel of the Italian boot and it encompasses the entire administrative area of the province of Lecce, a large part of the province of Brindisi and part of that of Taranto. The peninsula is known as Terra dOtranto, and in the past Sallentina. 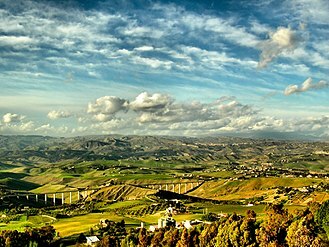 In ancient times it was called variously Calabria or Messapia, Messapia was the ancient name of a region of Italy largely corresponding to modern Salento. It was inhabited chiefly by the Messapii in classical times, pokorny derives the toponym from the reconstructed PIE *medhyo-, middle and PIE *ap-, water. 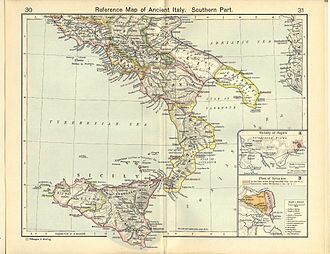 Pokorny compares the toponym Messapia to another ancient Italic toponym, salt water, Salento peninsula is composed of limestone, dividing the Adriatic Sea from the Ionian Sea. Its borders are, Taranto, in the Province of Taranto Pilone, in the territory of Ostuni, in the Province of Brindisi Santa Maria di Leuca, the nearest international airports are those of Brindisi and Bari. The Adriatic Sea /ˌeɪdriˈætᵻk/ is a body of water separating the Italian Peninsula from the Balkan peninsula and the Apennine Mountains from the Dinaric Alps and adjacent ranges. The Adriatic is the northernmost arm of the Mediterranean Sea, extending from the Strait of Otranto to the northwest, the countries with coasts on the Adriatic are Albania and Herzegovina, Greece, Italy and Slovenia. The Adriatic contains over 1,300 islands, mostly located along its eastern, Croatian and it is divided into three basins, the northern being the shallowest and the southern being the deepest, with a maximum depth of 1,233 metres. The Otranto Sill, a ridge, is located at the border between the Adriatic and Ionian Seas. The prevailing currents flow counterclockwise from the Strait of Otranto, along the eastern coast, tidal movements in the Adriatic are slight, although larger amplitudes are known to occur occasionally. The Adriatics salinity is lower than the Mediterraneans because the Adriatic collects a third of the water flowing into the Mediterranean. The surface water temperatures range from 30 °C in summer to 12 °C in winter. The Adriatic Sea sits on the Apulian or Adriatic Microplate, which separated from the African Plate in the Mesozoic era, the plates movement contributed to the formation of the surrounding mountain chains and Apennine tectonic uplift after its collision with the Eurasian plate. In the Late Oligocene, the Apennine Peninsula first formed, separating the Adriatic Basin from the rest of the Mediterranean, all types of sediment are found in the Adriatic, with the bulk of the material transported by the Po and other rivers on the western coast. The western coast is alluvial or terraced, while the eastern coast is indented with pronounced karstification. 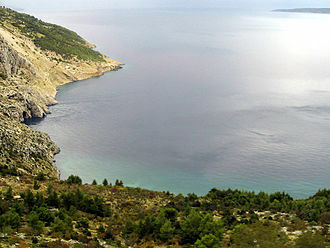 There are dozens of protected areas in the Adriatic, designed to protect the seas karst habitats. The sea is abundant in flora and fauna—more than 7,000 species are identified as native to the Adriatic, many of them endemic and threatened ones. The Adriatics shores are populated by more than 3.5 million people, the earliest settlements on the Adriatic shores were Etruscan and Greek. Corfu is a Greek island in the Ionian Sea. It is the second largest of the Ionian Islands, including its satellite islands. The island is part of the Corfu regional unit, and is administered as a single municipality, the municipality has an area of 610.936 km2, the island proper 592.877 km2. The principal city of the island and seat of the municipality is named Corfu, Corfu is home to the Ionian University. The island is bound up with the history of Greece from the beginnings of Greek mythology and its history is full of battles and conquests. Castles punctuating strategic locations across the island are a legacy of these struggles, two of these castles enclose its capital, which is the only city in Greece to be surrounded in such a way. 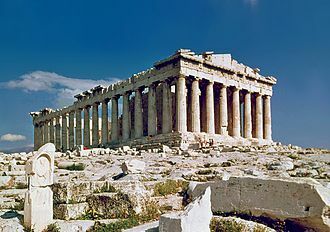 As a result, Corfus capital has been declared a Kastropolis by the Greek government. From medieval times and into the 17th century, the island was recognised as a bulwark of the European States against the Ottoman Empire, the fortifications of the island were used by the Venetians to defend against Ottoman intrusion into the Adriatic. Corfu repulsed several Ottoman sieges, before falling under British rule following the Napoleonic Wars, in 2007, the citys old quarter was added to the UNESCO World Heritage List, following a recommendation by ICOMOS. 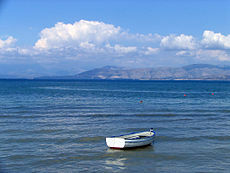 Corfu is a popular tourist destination. The island was the location of the 1994 European Union summit, the Greek name, Kerkyra or Korkyra, is related to two powerful water deities, god of the sea, and Asopos, an important Greek mainland river. According to myth, Poseidon fell in love with the beautiful nymph Korkyra, daughter of Asopos and river nymph Metope, Poseidon brought Korkyra to the hitherto unnamed island and, in marital bliss, offered her name to the place, which gradually evolved to Kerkyra. 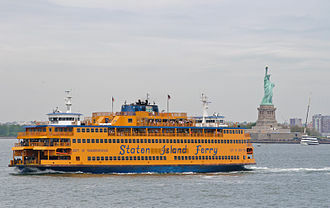 They had a child they called Phaiax, after whom the inhabitants of the island were named Phaiakes, Corfus nickname is the island of the Phaeacians. 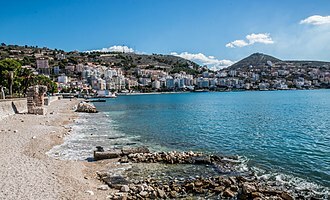 The name Corfù, an Italian version of the Byzantine Κορυφώ, meaning city of the peaks, derives from the Byzantine Greek Κορυφαί, the northeastern edge of Corfu lies off the coast of Sarandë, separated by straits varying in width from 3 to 23 km. An earthquake is the shaking of the surface of the Earth, resulting from the sudden release of energy in the Earths lithosphere that creates seismic waves. Earthquakes can range in size from those that are so weak that they cannot be felt to those violent enough to people around. The seismicity or seismic activity of an area refers to the frequency, Earthquakes are measured using measurements from seismometers. 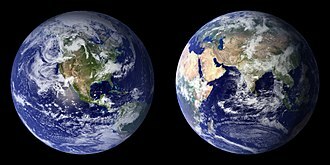 The moment magnitude is the most common scale on which earthquakes larger than approximately 5 are reported for the entire globe and these two scales are numerically similar over their range of validity. Magnitude 3 or lower earthquakes are mostly imperceptible or weak and magnitude 7 and over potentially cause damage over larger areas. The largest earthquakes in historic times have been of magnitude slightly over 9, intensity of shaking is measured on the modified Mercalli scale. The shallower an earthquake, the damage to structures it causes. At the Earths surface, earthquakes manifest themselves by shaking and sometimes displacement of the ground, when the epicenter of a large earthquake is located offshore, the seabed may be displaced sufficiently to cause a tsunami. Earthquakes can trigger landslides, and occasionally volcanic activity, in its most general sense, the word earthquake is used to describe any seismic event — whether natural or caused by humans — that generates seismic waves. Earthquakes are caused mostly by rupture of faults, but by other events such as volcanic activity, mine blasts. An earthquakes point of rupture is called its focus or hypocenter. The epicenter is the point at ground level directly above the hypocenter, tectonic earthquakes occur anywhere in the earth where there is sufficient stored elastic strain energy to drive fracture propagation along a fault plane. The sides of a fault move past each other smoothly and aseismically only if there are no irregularities or asperities along the surface that increase the frictional resistance. Most fault surfaces do have such asperities and this leads to a form of stick-slip behavior, once the fault has locked, continued relative motion between the plates leads to increasing stress and therefore, stored strain energy in the volume around the fault surface. Ithaca or Ithaka is a Greek island located in the Ionian Sea, off the northeast coast of Kefalonia and to the west of continental Greece. Ithacas main island has an area of 96 square kilometres and had a population in 2011 of 3,231 and it is the second-smallest of seven main Ionian Islands, after Paxi. Ithaca is a regional unit of the Ionian Islands region. Modern Ithaca is generally identified with Homers Ithaca, the home of Odysseus, the fact that classical Greek authors often used eponymous explanations to explain away names through folk etymology makes it more likely that Ithakos derives from Ithaca rather than vice versa. 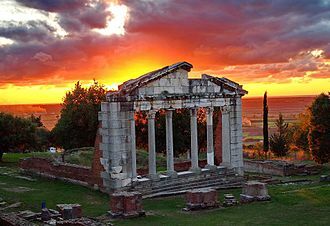 It may have been the capital of Cephalonia during the Mycenaean period, the Romans occupied the island in the 2nd century BC, and it became part of the Byzantine Empire. 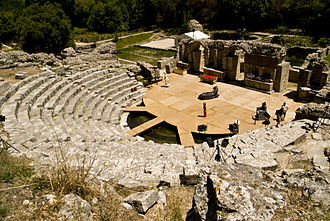 The Normans ruled Ithaca in the 13th century, and after a short Turkish rule it fell into Venetian hands, Ithaca was subsequently occupied by France under the 1797 Treaty of Campo Formio. It became a French possession again in 1807, until it was taken over by the United Kingdom in 1809, under the 1815 Treaty of Paris, Ithaca became a state of the United States of the Ionian Islands, a protectorate of the British Empire. In 1830 the local community requested to join with the rest of the newly restored nation-state of Greece. Under the 1864 Treaty of London, along with the remaining six Ionian islands, were ceded to Greece as a gesture of friendship to Greeces new Anglophile king. The United Kingdom kept its use of the harbour at Corfu. The origins of the first people to inhabit the island, which occurred during the last years of the Neolithic period, are not clear. The traces of buildings, walls and a road from time period prove that life existed and continued to do so during the Early Hellenic era. In the years some of the migrated to part of the island. The buildings and walls that were excavated showed the lifestyle of this period had remained primitive, during the Mycenaean period, Ithaca rose to the highest level of its ancient history. The Ithacans were characterized as great navigators and explorers with daring expeditions reaching further than the Mediterranean Sea, the epic poems of Homer, the Iliad and the Odyssey, shed some light on Bronze-Age Ithaca. The ancient theatre of Titani. Depiction of the castle from a painting by Francesco Hayez (1791–1882). A 360-degree panoramic image of Parga from the peer. 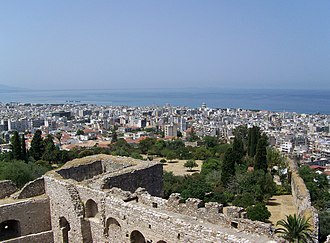 Google's Earth view of Patras. A view of Panachaiko mountain. 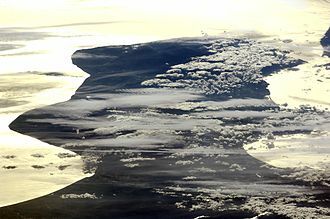 The island of Lefkada in a NASA World Wind satellite picture. 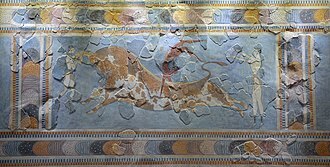 Exhibits at the Archaeological Museum of Argostoli. 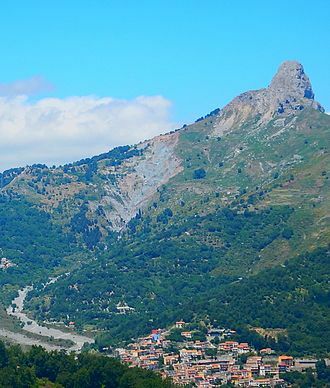 Taormina seen from Mount Venere, in the Peloritani mountains. 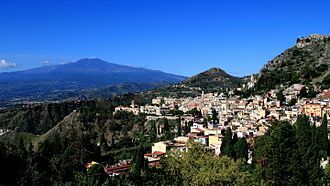 View of the Taormina coast. Taormina as seen from the Saracen castle overlooking the town. The theatre is visible in the distance. 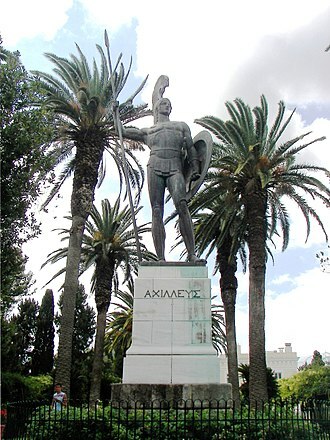 The statue of Achilles in the gardens of the Achilleion (Corfu). The Lion of St. Mark, symbol of the Venetian Republic, at the New Fortress of Corfu, the longest-held of Venice's overseas possessions. Ioannis Kapodistrias from Corfu island, first governor of the modern Greek state. Head of Odysseus wearing a pileus depicted on a 3rd-century BC coin from Ithaca. Olive tree of Ithaca that is claimed to be at least 1500 years old. Church of S. Giovanni al Sepolcro. Bell tower of the church of San Benedetto. Beach in Conca Specchiulla, north of Otranto. Santa Maria al Bagno seaside. 16th century coastal tower of Salento, in Roca Vecchia. 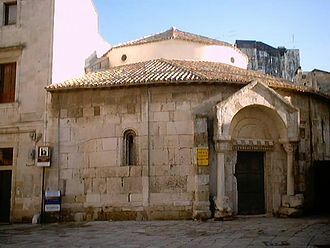 Evangelistria Church, St. George's castle.